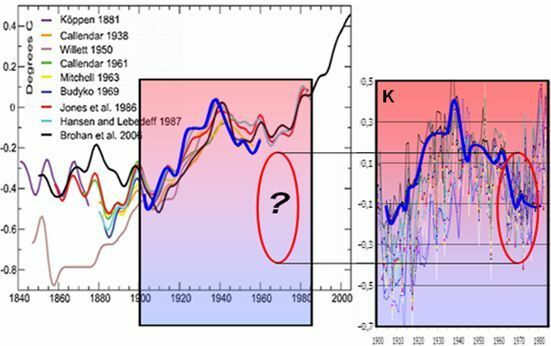 ← Where should we expect UHI in temperature data 1979-2009? 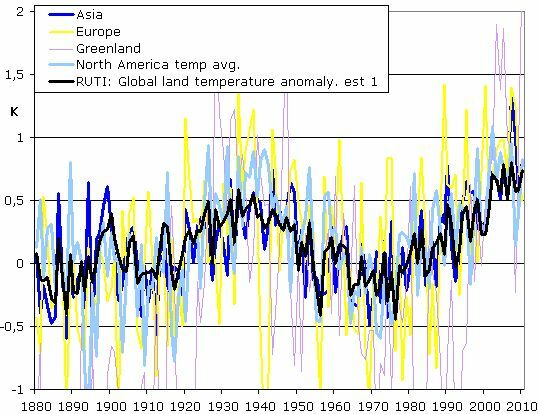 First estimate of global land temperature trends from the RUTI project , recently presented at Joanne Novas for the Coastal-Noncoastal issues. 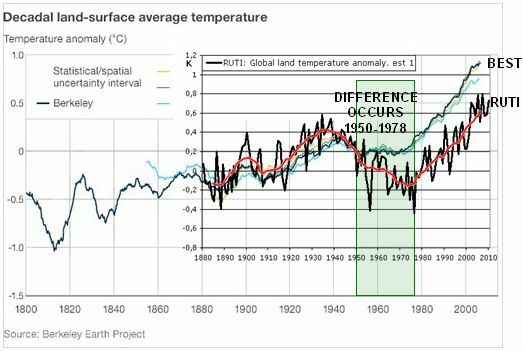 … Between 1950 and 1978, the BEST results for global land temperatures have 0,55K more warming than RUTI. Otherwise, the 2 datasets are strikingly similar …. Fig1. 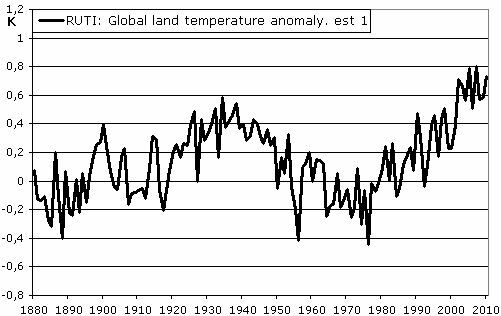 First estimate of global land temperature trends. 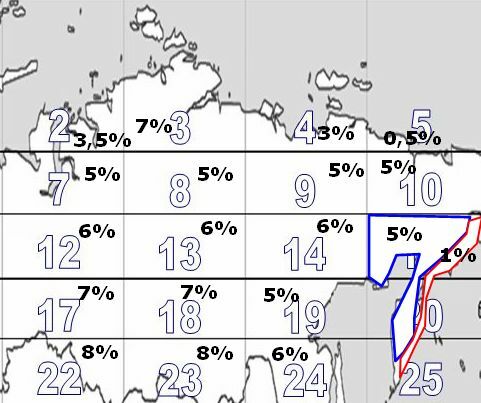 As always in the RUTI project, data are unadjusted GHCN and the main efforts in the RUTI project is to identify areas of similar temperature trend before averaging – this due to limited data periods made available from GHCN (see more). As will be the case for all data sources, older data, especially before 1900 has limited data as foundation. 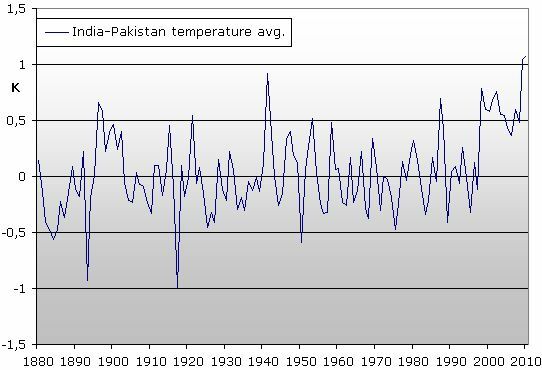 All RUTI data in the present article use 1961-90 as base period. 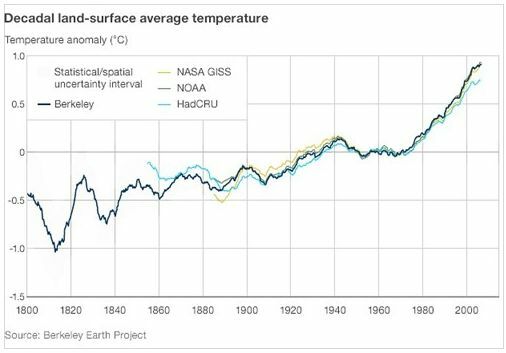 1) Temperature peak in the latest decade appears to be around 0,22 K warmer than the 1940´ies heat peak. 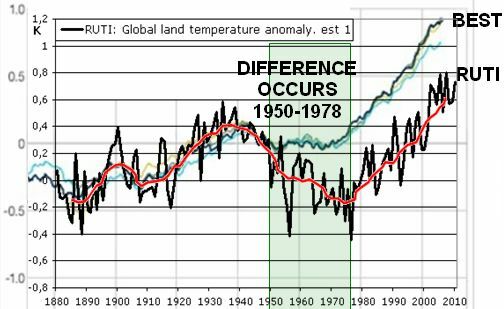 2) We see a strong temperature decline 1940-78 around 0,55-0,6 K.
BEST has around 0,55 K more heat in their results than RUTI, and that this difference mostly occurs between 1950 and 1978. Fig1c. 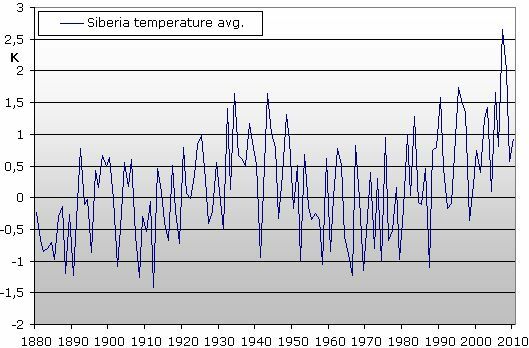 The difference in temperature trends 1950-78 is best illustrated by setting temperatures 1940-50 for the two datasets to be equal. If RUTI has significant errors exactly in the period 1950 to 1978 this is truly odd. 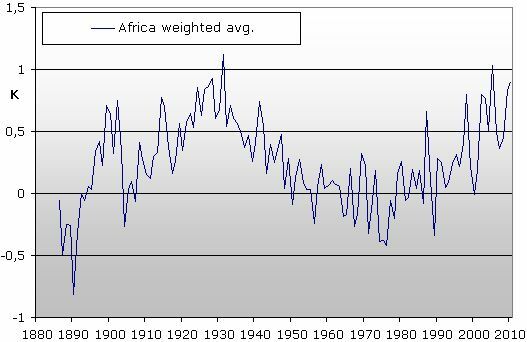 1950-78 is definitely a period with far most data available from Unadjusted GHCN, and should be just about the most solid part of the RUTI data. Imagine that BEST was correct, and RUTI was 0,55K wrong 1950-78…. 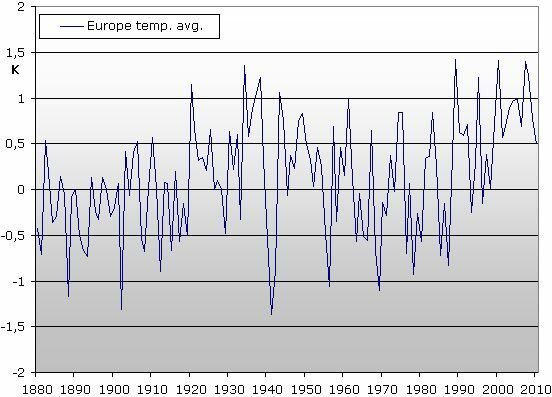 – Then IN AVERAGE I should have added 0,55K to ALL temperature sets used (around 1200) between 1950-78. 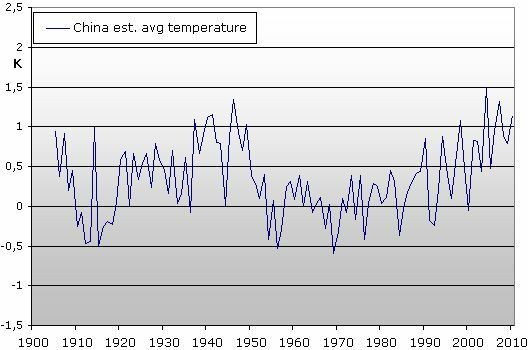 IF THERE WAS NO 0,55K DECLINE IN TEMPERATURE DATA 1940-78, THERE WOULD BE NO 0,55K DECLINE IN UNADJUSTED GHCN DATA AS SHOWN IN THE RUTI PROJECT. 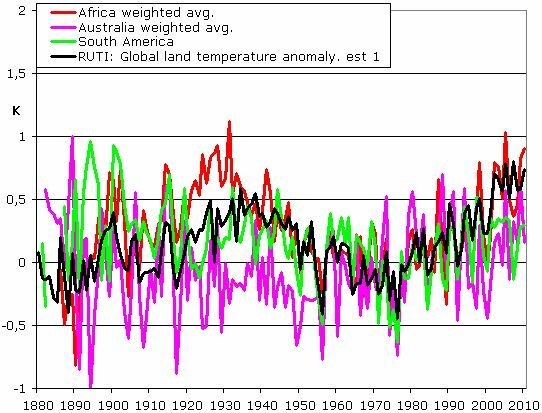 About RUTI global land temperatures – First estimates. Fig2. 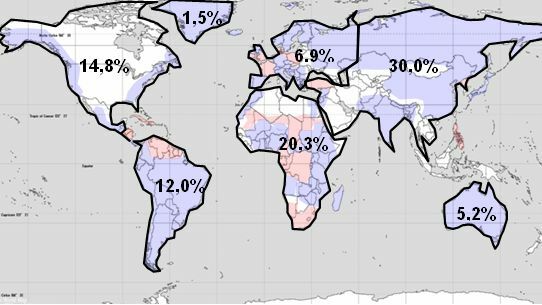 The first estimate of RUTI global land average is based on the above blue areas. 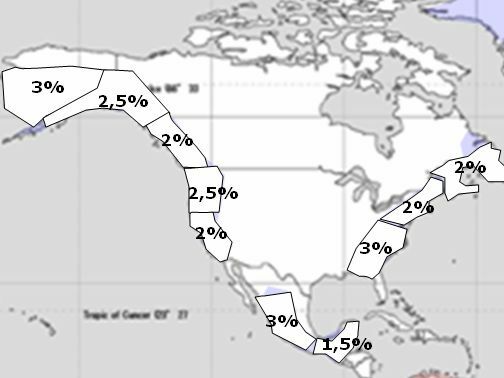 Primarily the central North America data are not yet included, and some central Asian areas. 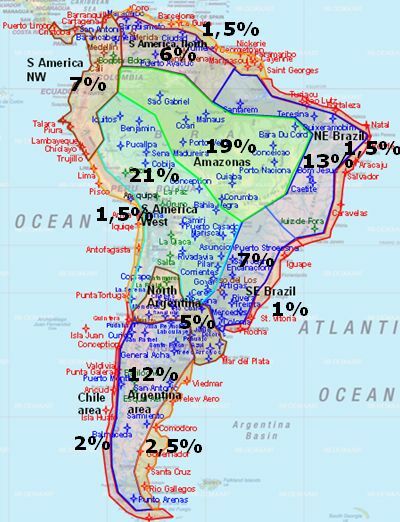 Red areas: Data not available or too low quality for any scientific use. White areas: Areas that still needs further analysis, and some of these will be included in RUTI. Fig3a. Northern hemisphere continents show great similarity. Remember: If BEST was correct, each area should include a 0,55K ERROR decline 1950-78. Fig3b. 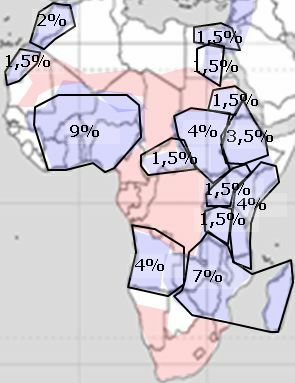 For Africa and then the 2 SH continents, trends are somewhat more mixed. 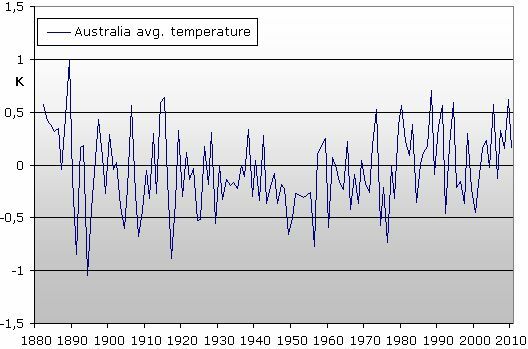 Especially Australia shows a much more flat trend than all other continents. MORE DETAILS: See much more details on all areas from the RUTI project . Below the large area trends and weighting shown. Fig5. 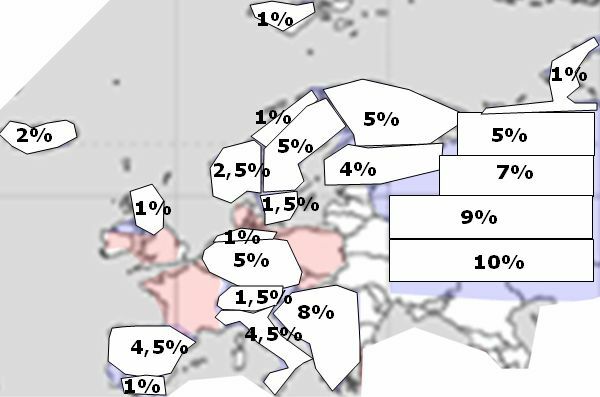 Trends for areas weighted as shown. Fig7. 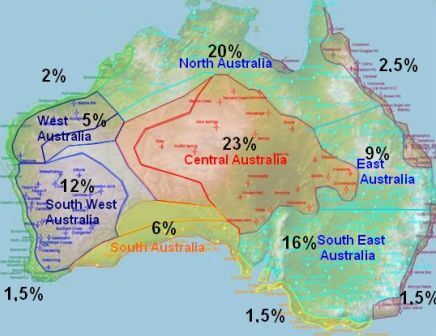 Trends for areas weighted as shown. Fig8. 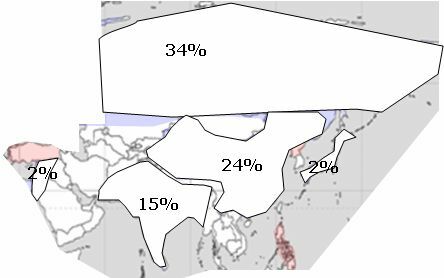 in the Asia data we have included the large Siberian area. Fig9. 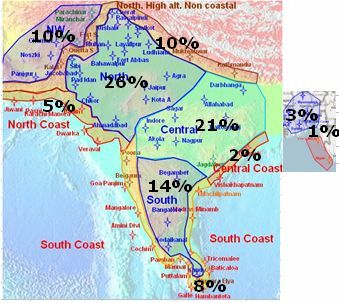 Trends for areas weighted as shown. Fig10. Trends for areas weighted as shown. Fig11. This area includes parts of Afghanistan, all Pakistan, India, most of Bangladesh and a bit of Burma. Fig11a. 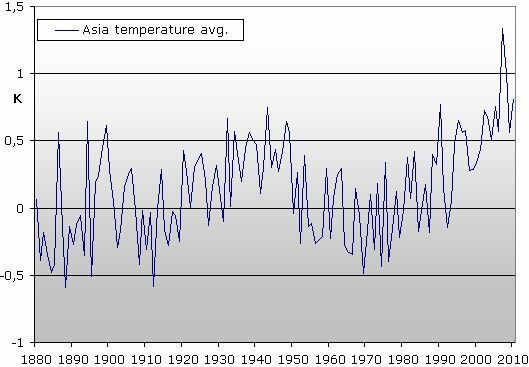 Temperature trends for China. (A small part of China near himalayahs highest altitudes is not yet included. I am writing on RUTI: Himalayah article for that area, coming up). Fig11b. 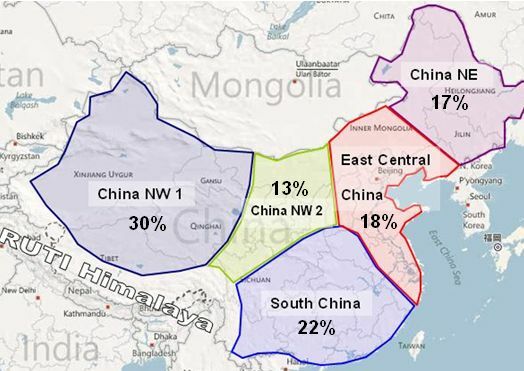 China, trends for areas weighted as shown. Fig13. Trends for areas weighted as shown. Fig15. Trends for areas weighted as shown. Fig17. 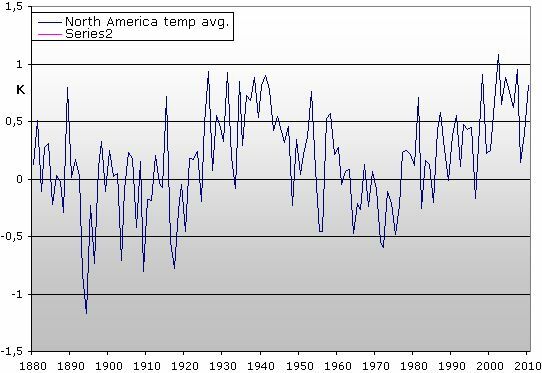 In the next estimate RUTI global land temperatures the remaining North America will be included. The trends found in the above areas are weighted as shown, and the resulting trend is used with weight as full North America in the global trend, to get closest to the correct result. Fig18. 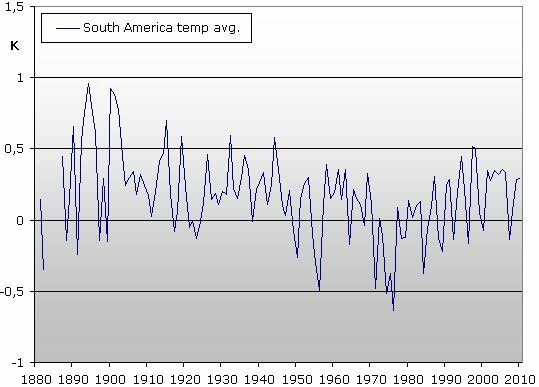 South American temperature trends. Fig19. Trends for areas weighted as shown. See much more details on all areas from the RUTI project .